M.F. : Could you tell us how did you confront Karate after you got sick? T.K. : After I got over the worse part of my heart attack, I had a great surprise. The doctors told me I had accumulated a lot of liquid in my lungs. They did not know why, because according to them, this had to have happened during many years, and I should have noticed it, but I did not have any problem with my health. In terms of my recuperation, it is important to keep in mind Yoshitaka Funakoshi´s experience. Even though he was sick and was spending most of the time in bed, at night he would put on my Karate uniform and he was strong and dynamic as if nothing had ever happened. That is the reason why during my recovery, I used to think about it and I decided to accept the challenge to show that with Karate you can overcome problems, including health problems. The doctors had told me that it would be better to stop practicing and teaching Karate and that I should abandon it completely. So while I was sick I also remembered the experience of Sensei Egami, one of my other Seniors, from whom I also received classes. Sensei Egami was likewise very sick and had several surgeries, which among others things caused him to difficulty breathing. Nevertheless, when he gave classes with his assistant, Sensei Takagi, Egami recovered his breathing in a special way and then he used to say, “Ok, now I am going to teach you”, and he would let them attack, he would apply defenses and counter attacks that were very fast and most of all very powerful. That is why I decided to learn from my Seniors and to test the same things. That is, even though I cannot always be well, I can maintain an explosive power for a short space of time and then later recuperate myself and so on successively. M.F. : Who were Karate Masters or instructors from whom you received classes? T.K. : We were members of the Shotokan-Dojo and officially the Shihan ( a high ranking Master) was Funakoshi Gichin and the second Shihan Funakoshi Yoshitaka (his son). Another instructor from whom I received classes was Hironishi Genshin. But also in addition to that, we also attended classes at the Karate University. Once a week, in an official way, different instructors were invited, such as Funakoshi Gichin, Yoshitaka, Hironishi, Kawata, Okuyama, Hayashi, Uemura, Kubota and others. Therefore, the education was not as generally understood, for we were influenced by several instructors. At least once a week we had an instructor invited to the University of Senshu. M.F. : You have spoken to us a lot about Sensei Okuyama Tadao, who we understand was, and still is, a very special person. Tell us about him and why you appreciate him so. T.K. : In order to speak about Sensei Okuyama, I will go back to the days when the five Shotokan Universities carried out their DAN (level) exams together. In these exams Kata, Kihon and Kihon-Kumite were practiced and the Senior instructors graded them. 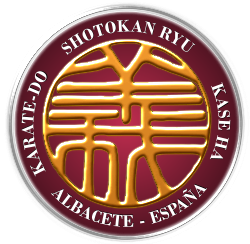 The applicants did Kumite with them and after the exam, it was usual for one of the Seniors to do Kumite (combat) with the applicants. That was where Sensei Okuyama appeared. That moment as I recall, was really sensational, because he attacked with greater speed and force than any of the others. The applicants could not even react. There was no way to defend oneself from Sensei Okuyama, he was over you with his fist in your face before you knew what was happening. Everybody was amazed by his ability. Oh! and about the Dan exams at the end of the 2nd World War. Shimamura, Jotaru Takagi and I were the first ones to take the exams of SANDAN (3rd Dan). This was the first exam in which we did Kumite among us. In this exam Motokuni Sugiura – presently Chief Instructor of JKA/World Federation – passed the SHODAN (1st Dan). M.F. : Could you tell our readers why Yoshitaka Funakoshi had so much influence in the evolution of Shotokan Karate? T.K. : When I began practicing Karate, our Seniors told us that Sensei Funakoshi Gichin was the pioneer of Karate. But they also told us that the evolution, revolution and development was carried out by his son Yoshitaka. His Karate was faster, stronger and more dynamic. Sensei Yoshitaka searched for validity, and efficiency. He wanted to know if the techniques really worked against the attacks. But what is really important to understand, is that the great development from Sensei Funakoshi Gichin’s Karate , to the Karate performed by Sensei Yoshitaka, was possible thanks to the O-Waza (long distance technique) concept, with maximum speed and force. However, we must not linger on this point, as what is really important is to master the O-waza in order to be able to be efficient in Ko-waza (short distance technique). Gichin Funakoshi even said that Seite ( when one arm defends and the other counterattacks) is important, but more so is Hente (defense and counterattack with the same arm) – Hente is directly related to the Ko-waza practice. For this reason, it is especially important to understand the O-waza concept and its history. Let’s imagine that the performance of a Tsuki at a distance of a meter took “X” time. Well, what Sensei Yoshitaka did was increase the distance little by little, maybe two or three meters, trying to do it in the same amount of time. This would then be more efficient, and that is where the importance of the Fudo-Dachi position comes in. When at war, the ancient Samurais gave great importance to the Ko-Waza movements (short distance techniques), in need of immediate action, since their lives were at stake at this distance. Later, when at peace, the space for the techniques was increased, giving more importance to O-Waza (long distance) as training method. For example, long distance techniques were used in Kendo, in order to develop and strengthen the body, as an exercise. However, a good use of this training system helps prepare the muscles and after that practice Ko-Waza efficiently. With respect to the position work, Funakoshi’s (senior) specialty was Kiba-Dachi. Yoshitaka watched it and after some experiments created the Fudo-Dachi position, following his style of more explosive and long distance techniques. This is the reason for this new position, since these techniques performed from a Zenkutsu-Dachi position, lose a lot of their efficiency. The same thing happens with the different types of movements. From Fudo-Dachi we can move and change our direction at maximum speed and stability, which is not the case with the others. A clear example of the aim for more distance and depth in the advance of a Tsuki, is the technical sequence of : “Fumi Komi- Soe Ashi ; Gedan Tsuki – Soto Uke” of the Empi Kata. M.F. : When did you see Yoshitaka Funakoshi for the first time? T.K. : It was in 1944. Although the beginner’s class was usually taught by Sensei Hironishi, one day a different Sensei came in. I did not know him and when I asked who it was they told me that he was Waka Sensei (the young Sensei), son of Gichin Funakoshi. In this class, Yoshitaka Sensei taught us how to practice Mae-Geri slowly, and without lowering the leg to the floor, also how to do a Yoko-Geri, then withholding the Yoko-Geri, how to do a Mawashi-Geri. After that he said: “now I will show you how we do it normally” and gave three kicks that were so fast and strong, that I still remember seeing the white flash of the Karate uniform pant and a noise that sounded like a storm. We were all very impressed. When our Seniors taught us Kata, they told us that when Yoshitaka Funakoshi did Kata, those who saw him felt a special sensation, the tremendous impression of impending danger. That was the way – they said – Katas should be performed. The people watching must feel and notice something, feel the vibration of our inner force and determination. If the spectators do not feel anything, then the Kata is not correctly performed, it is a “gymnastic or dancing” kata. M.F. : You always talk to us about the importance of breathing and the Hara, in your classes. Could you tell us about it? T.K. : The importance of the Hara (point about three centimetres under the navel) in Budô comes from two different sources. One is Zen meditation. In Zen they discovered that after the normal or chest breathing, in the lungs, the air could be lowered, while breathing, to the center of the body– to the Hara. This allowed a greater stability and ability to control the inside of the body. With this method the movements improved considerably. On the other hand there are the Samurais, some of them noticed that if instead of using the muscular strength of the shoulders, they used a point that was lower, meaning the Hara. The realized that the techniques were more efficient and had greater possibilities of success. You push the air towards the Hara, keep it compressed there and use that extra energy as a powerful force to perform the techniques. The correct breathing towards the Hara and the subsequent compression, allows the development of the powerful force that is essential for example, in the Sambon-Tsuki, Sandan-Tsuki, or in the Hente (techniques carried out with the same arm), These could not be efficiently performed with the lung level breathing, nor with the muscular strength of the shoulders. Maximum efficiency is only possible with the powerful force generated by the breathing, the stabilizing and the compression of the Hara. M.F. : You have sometimes spoken to us about some very important and unknown concepts, such as TOATE. Could you give us a simple explanation of it? T.K. : TOATE means to touch without physically touching. An example of how to begin controlling this capacity is: when we block the attacker vigorously, with a lot of energy, at the beginning of the attack, and continue doing so repeatedly many times, with a lot of concentration and the correct breathing, and then one of the times we do not block him, he feels as if we had and does not attack, he is doubtful. This would be an example of initiation to TOATE, but there is a lot more and only a few like Sensei Egami or Yoshitaka have studied this thoroughly. With respect to this angle of TOATE, on a higher level, once he told us that long ago, some Budô masters or Samurais were capable of paralysing small birds or bats without touching them. They simply concentrated on them, focussing them with their eyes, breath or Kiai and paralysed them long enough to be able to drive their spear into them.. M.F. : What parts of the Budô practice would you like to emphasize? M.F. : Do you believe that the Karate-dô or the Budô have some mysterious elements, or that are only accessible to a few? T.K. : No, what happens is that in the correct practice of Budô you must cover a long distance. I believe I have reached it many times while on other occasions I think I am near but have not yet arrived. For this reason, anyone can progress in Budô, just as long as they follow the correct direction to go from one level to the other. This is what really makes a difference between performers. What is really important is not the number of years you practice but the correct practice during those years. This is the only way to progress towards a superior Karate. When somebody asks me why we practice so many attack techniques, so frequently and stronger each time, my answer is that when you experiment with the sensations, attacking and searching for more force, our defenses get stronger. When we manage to perform a stronger attack, we must ask ourselves if we would have been able to repel such a fast and powerful attack. M.F. : Finally, could you give us Karate artists some advice? T.K. : My advice for the pupils of Karate-Do is very simple. You must remember what Gichin Funakishi said – “Karate Ni Sente Nashi” (There is no first attack in Karate), and understand the idea. Mentally as well as technically. You must do everything possible so that the attacker mentally understands that it is better for him not to attack, to feel it and accept this. This is the true meaning of the saying “Karate Ni Sente Nashi” – that the adversary does not begin attacking and so there is no fight .